It’s been an exciting year so far for perfumery with launches of lines like Parfumerie Generale and Art of Perfumery. Thankfully for lovers of tea-inspired aromas, they both offer similar yet distinct takes on the smoked leaf. Sniffing Art of Perfumery's no. 6, Spice Smoked Wood, I’m reminded of Parfumerie Generale's L’Eau Rare Matale, with even the notes looking remarkably similar. While Matale heads for lighter territory with a crown of floral notes lifting the spicier heart notes, no. 6 goes for broke with notes of nutmeg, cedar, Chinese tea oil, pepper, clove, cinnamon, clary sage, Grasse lavender, Argentinian mate, moss, smoked woods and patchouli. If it seems like no. 6 has something in common with another famous tea scent, L’Artisan’s masterpiece Tea for Two, you’d be correct. The two are at times uncannily similar, but more about that in a moment. No. 6 opens with a mélange of woods and spices recalling Japanese incense (think Santa Maria Novella Citta di Kyoto or Tann Rokka Kisu). Attention is then drawn to the middle notes by the tea oil and mate leaf, a somewhat smokey, green aroma that recalls Comme des Garcon’s early take on tea in its Green series. The mossy base notes serve as anchors, providing a foundation of soft lavender and woods. Longevity and sillage are both above average here with the spice notes really drawing out the allusion to chai tea. This is where the comparison to Tea for Two arises. Though L’Artisan’s tea is chock full of ginger, honey and cinnamon, no. 6 seems somehow simpler, more straightforward, and not as sweet a scent. Whereas Tea for Two is a gourmand wunderkind, a large, brash scent, cozily aromatic, no. 6 is streamlined, simpler and smokier. With tea continuing to be a popular trend in contemporary perfumery, there’s no doubt in my mind that no. 6, with nods to Matale and Tea for Two, stands as one of the most interesting and innovative interpretations I’ve yet to come across, most successfully marrying two of my favorite genres, incense/spice and smoked tea. 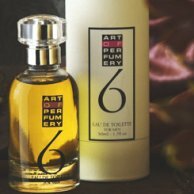 For purchasing information, see the listing for Art of Perfumery under Perfume Houses. Marlen, No. 6 was my favourite of all the AoPs, but for some reason I always think of it as a leather perfume. It startles me every time I'm reminded that it's actually a tea-based scent! I can't even see any notes that would give the impression of leather, but that's what I'm getting. I think leather-lovers (as it were) might be interested in checking this one out. Nice review – good to see AoP being mentioned, as their CS is excellent. I'm fond of many of those notes, myself. So lovely to see you here- I always enjoy your musings and opinions. I really enjoyed all of the AoP fragrances, but this one was dearest to my heat, and I DO understand what you're saying about the leather aspect! Thanks so much for your comments, C. Hope you get a chance to try this out!